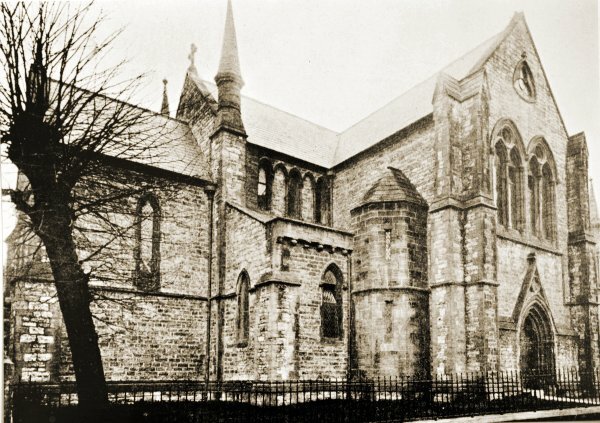 "A New Church was erected in Peter-street, and called Trinity District Church - built partly by grants and partly by voluntary subscriptions, the minister's stipend arising from an endowment, under the Act of Parliament, of £150 a year, and the rents from a certain number of pews. 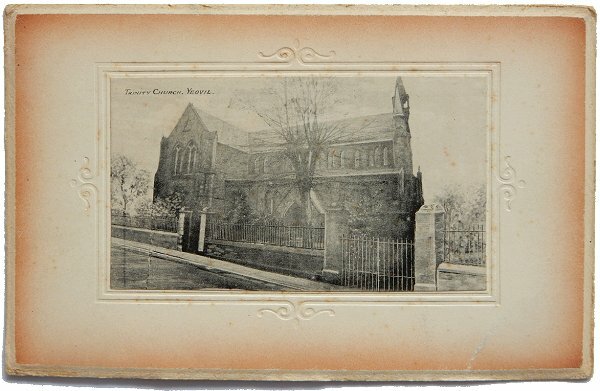 The foundation stone was laid on the 24th June 1843, the ceremony commencing with Divine service at the mother church; prayers being read by the Rev Robert Phelips, and the sermon preached by the Rev C Deeds, the Rural Dean, after which a collection was made which amounted to £65 0s 5d. A procession was formed to the site of the proposed new Church, and the stone was laid by the Rev. Commissary. 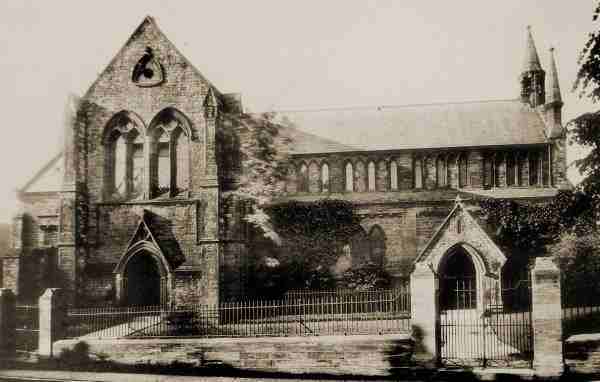 The church was consecrated on the 28th of October 1846, by the Lord Bishop of Bath and Wells, who preached the sermon, the new incumbent, the Rev. J. Williams, reading the prayers. The collection amounted to £100. The church, which is built from designs furnished by the architect, Mr. B. Ferry, is in the early English style, which prevailed about the 13th century, and consists of a nave, aisles, transepts and chancel. The extreme length of the interior is 104 feet, and it is 60 feet 6 inches across the transepts; the extreme height from the floor to the roof is 41 feet. The principal tradesmen closed their shops during the ceremony, and the Sunday and day school children, to the number of 500, were kindly regaled with tea and plum cake. 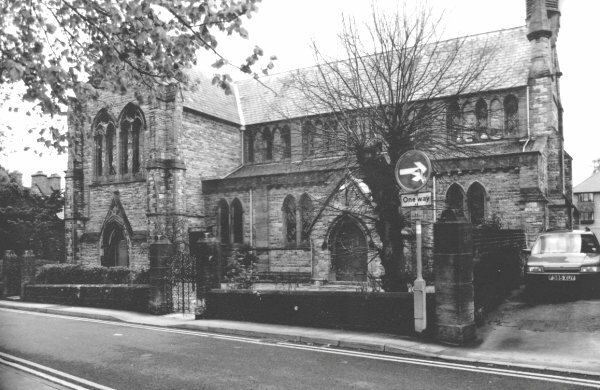 The Rev J Williams continued incumbent until the year 1854, when he resigned in consequence of Mrs Williams's ill health, and the present incumbent, the Rev JD Elliott, was appointed in his stead. The cost of the erection was about £2000." A vicarage was provided for the Vicar of Hendford at 70 Hendford. In 1851 it was the residence of Rev John Williams and his wife Ann, together with two servants. In 1871 two middle-aged ladies were in residence 'in charge of house'. In 1881 the new Curate of Hendford, Henry Toft from Derbyshire was in residence with his wife Harriett and young niece Edith. By 1891 Abel Williams was in residence with his wife Frances, five children aged between 23 and 7, a cook and a housemaid. Abel listed his occupation as 'Clerk in Holy Orders (Vicar of Hendford)'. In 1901 the vicarage was vacant. "Church, erected in 1846 by Benjamin Ferrey. Ham stone ashlar with Welsh slated roof. Cruciform plan with 4-bays to nave, with added North and South aisles, chapels to the East of the transepts and sanctuary set lower than the chancel: no tower, but a small turret to the West end, all predominantly in a C13 style. 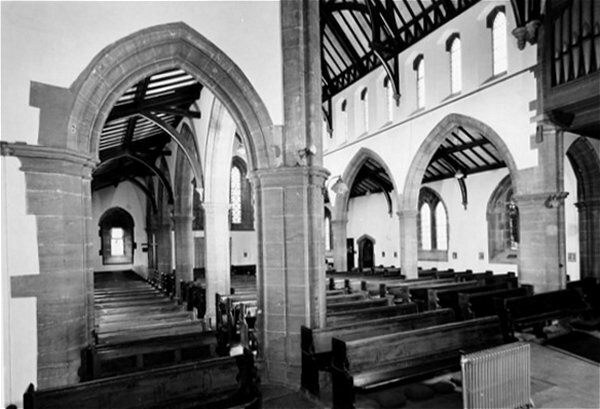 The North elevation divided into bays by flat pilasters, the aisle windows being double lancets with joined arched labels; the clerestory windows being 3-lancets per bay, more widely spaced, with blind panels under the joined labels: the aisle has corbel tabling to a low parapet. 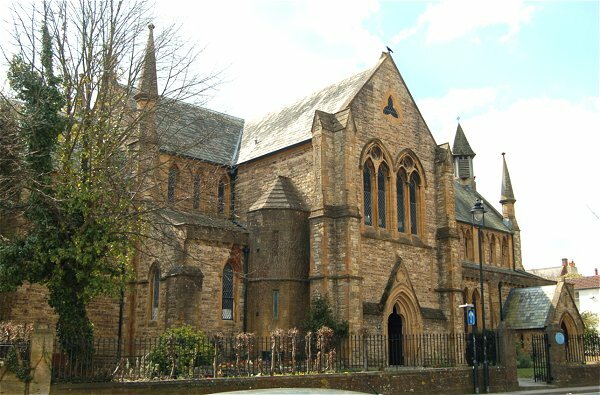 The projecting North Transept has angle buttresses with slight offsets and roofed tops, with a door set in a gabled and cusped pointed arch, above which is a pair of late C13 pattern traceried windows, and in the gable a small trefoil window. There is a single lancet window to the sanctuary; there are 4-pinnacled turrets to the four corners of the nave elevation, now clearly visible from South Street, follows the same pattern: the end elevations unremarkable save for the wooden bell turret with shingled roof to the West end; there is a triple lancet to the West end, and a triple lancet with trefoil window over the East end. Internally the church is lofty, on an open plan. The arcades are of typical C13 style, and the roof is of a hammer beam trussed rafter pattern with arched wind braces above and below the central purlins. The rear bay of the Nave partitioned off with a late C20 glazed screen. The 1908 Walker organ is set over the choir vestry in the North transept. 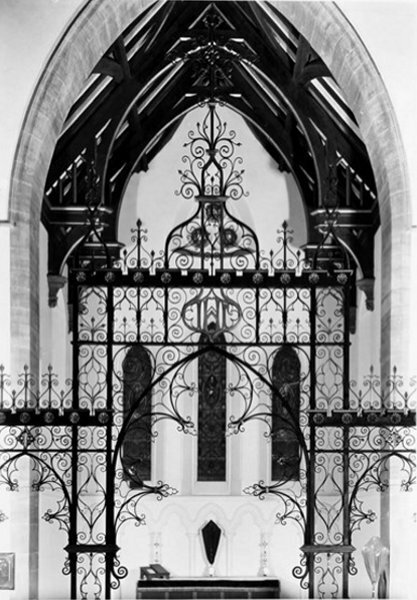 There is a fine wrought iron screen to the sanctuary (seemingly repositioned from the chancel, which has no separate crossing arch). The pulpit, choir stalls and pews have been removed, the latter being replaced by 1970's seating. The original font and wooden cover remain." There were seven stained lancet windows, one of which commemorated the close of the South African War and another was placed in 1897 by Miss Greenham. 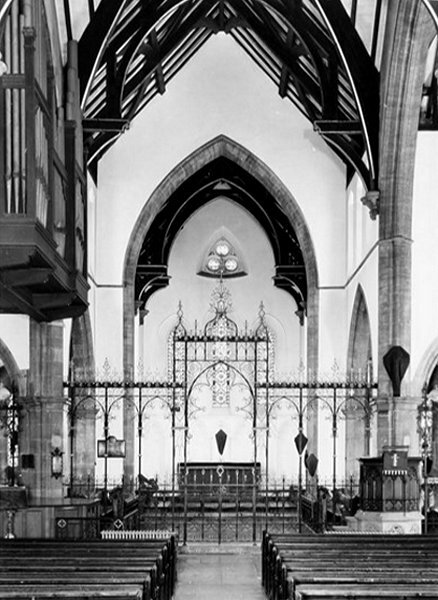 In 1896 a wrought iron screen was erected and extended on one side in 1906 in memory of local draper Robert Damon and on the other side in memory of John Newman. Robert Damon was a churchwarden for eighteen years at Holy Trinity and John Newman was its first churchwarden. Also in 1906 a five-light stained glass window depicting the four Evangelists was placed in the south transept of Holy Trinity in memory of Robert Damon by his brother Edmund. 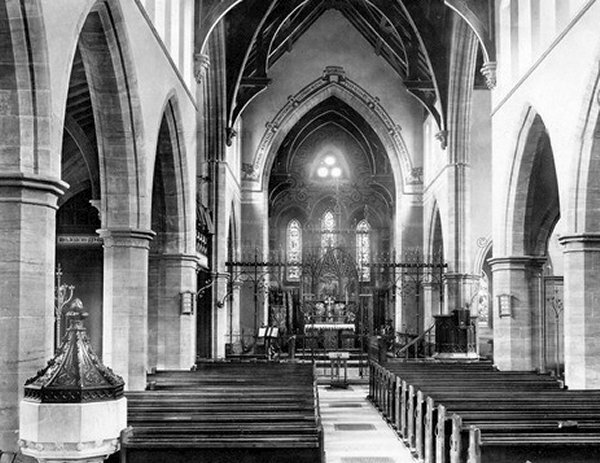 In the 1970s the interior was re-arranged: the pulpit, pews and stalls were removed and a freestanding altar was placed within the eastern bay of the nave, the chancel screen being moved one bay further east to close the entrance to the former sanctuary, which became a chapel. From me - "My daughter, Rose, was baptised at Holy Trinity on 15 October 1977 - the day after the singer Bing Crosby died on a golf course in Madrid. I seem to remember the sermon being more concerned with the passing of Bing Crosby than anything else." 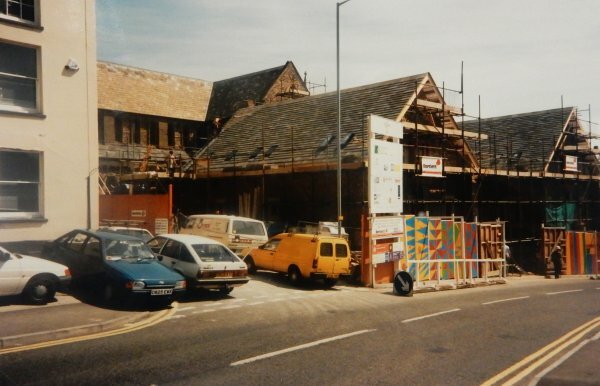 Congregations declined and in the 1980s plans were set in place to relocate the church to Lysander Road. The new church was completed in 1998. 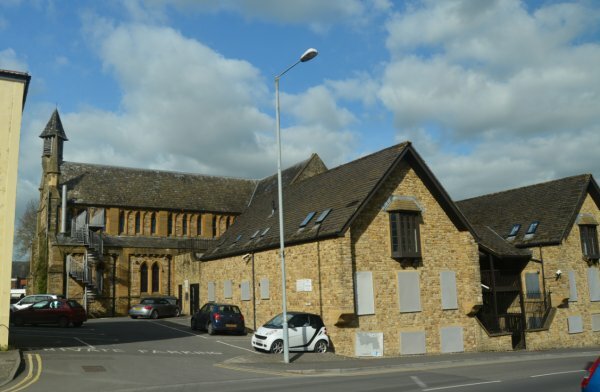 The original church, once declared redundant, was converted by Knightstone Housing Association to Yeovil Trinity Foyer in 1996 to provide accommodation and training to young people aged between 16 and 24 years old. This facility has recently closed. 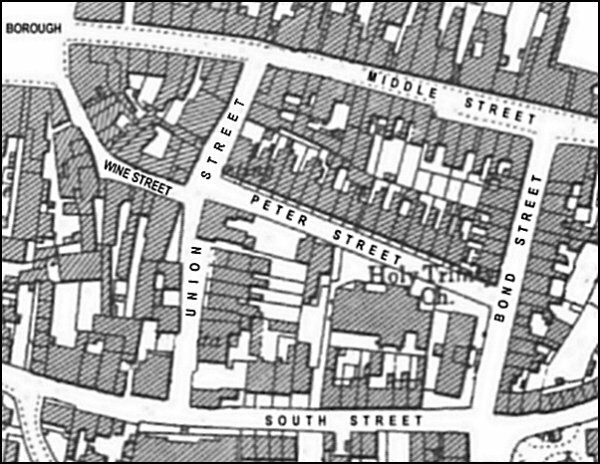 Map based on the 1901 Ordnance Survey showing the location of Holy Trinity church on the south side, towards the eastern end of Peter Street. A sketch, but almost certainly drawn at the same time as the 1850 sketch below. 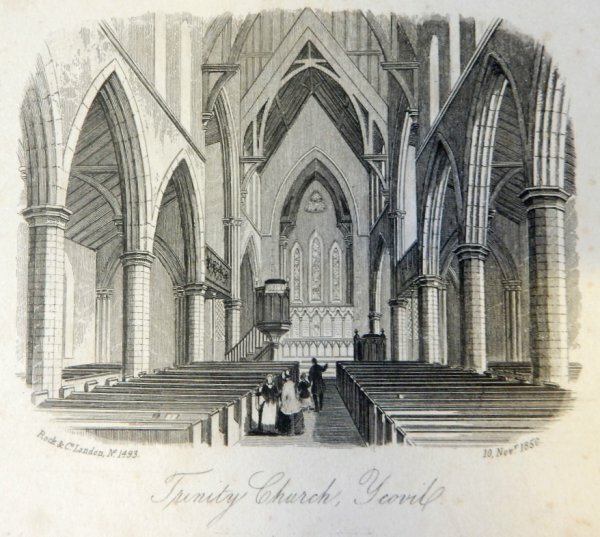 A sketch of the church interior dated 10 November 1850. From my collection - This image features in my book 'Yeovil - The Postcard Collection'. 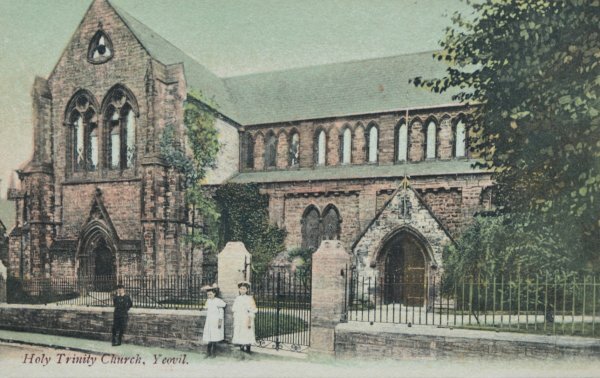 A postcard of Holy Trinity dating to about 1900. The nave of Holy Trinity, looking towards the chancel. Photographed around 1900 by Whitby & Sons and published in their 'Views of Yeovil'. Back Row (left to right) - P Winsor, W Neal, HV Munford, L White, L Arnold. Middle Row (left to right) - John Edwards (Verger), B Martin, G Courtney, L Webber, JJ Stone, JE Sellars, WM Palmer, CP Ewens, WJ Preston, F Hebditch, F Ricketts, W Brett (Organ Blower). Front Row (left to right) - R Elliott, H Baker, F Axe, D Arnold, BB Swaffield (Organist), Rev A Sewell (Curate), Rev CAW Robins (Vicar), Rev AW Giffard (Curate), Fred Plank (Hon Sec & Treasurer), J Elliott, G Masters, B Cox, B Hann. Front, kneeling - F Butts (left), G Rundle (right). Back row (left to right) - J Swaffield (9 Sep), J Sugg (11 Aug), L Arnold (13 Jan), H Dade (7 Dec), G Courtnay (11 Jan), G Hoskins (4 Jul). 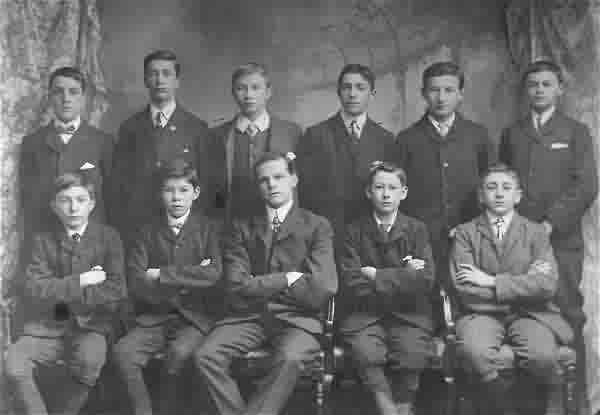 Front row ()left to right) - H Marsh (3 Jan), E Boobyer, (22 Jun), CP Ewens (23 Nov), F Gillingham (29 Jul), E Luffman (16 Sep). 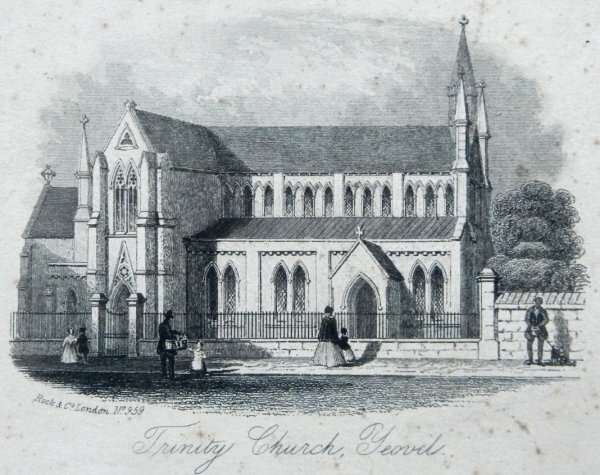 Holy Trinity, photographed by Whitby & Sons and published in their 'Views of Yeovil'. This postcard, complete with message and address, was never sent but, judging by the message, it dates to about 1914. 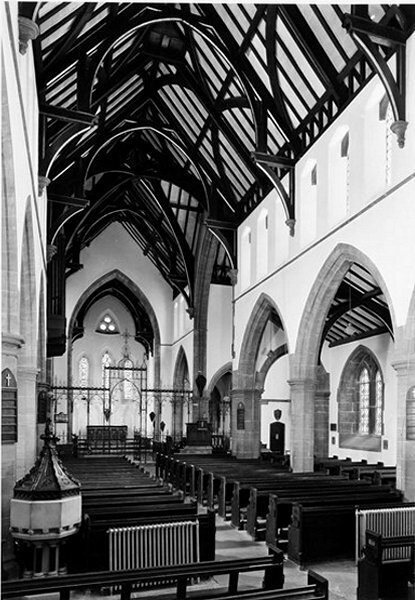 The nave, looking towards the chancel. Photographed in 1968. 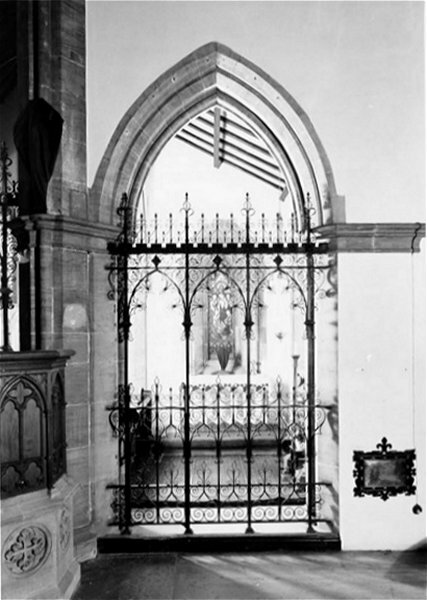 The chancel and wrought iron screen. Photographed in 1968. A transept side chapel with ornate wrought iron screen. Photographed in 1968. The other transept side chapel with ornate wrought iron screen. Photographed in 1968. View of the aisles and nave. Photographed in 1968. 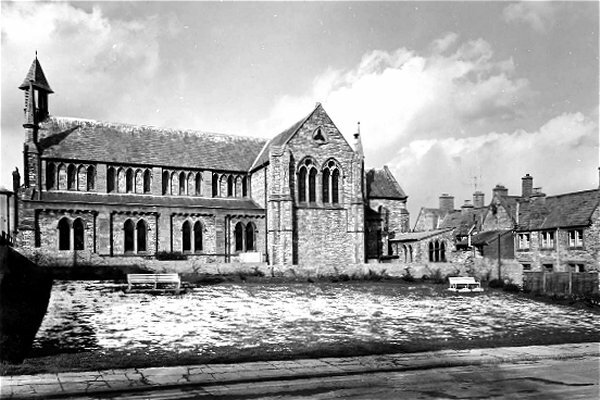 A sight not seen for many years - the south elevation of Holy Trinity church facing South Street, probably during the 1960s. 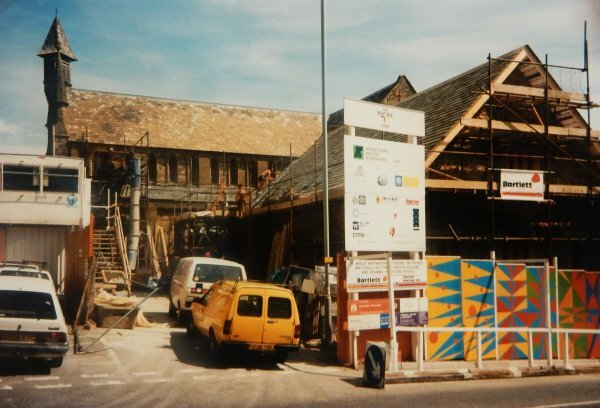 .... and then came Yeovil Trinity Foyer - seen here under construction during 1996, part of the conversion of Holy Trinity church. Holy Trinity church, photographed in 2013. 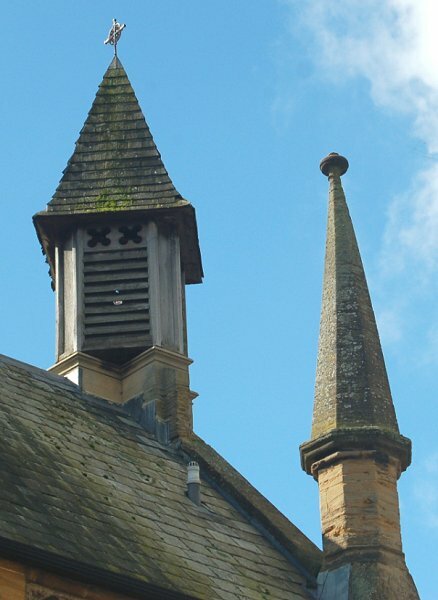 Holy Trinity's bell turret and "wonky" pinnacle. Photographed in 2013. 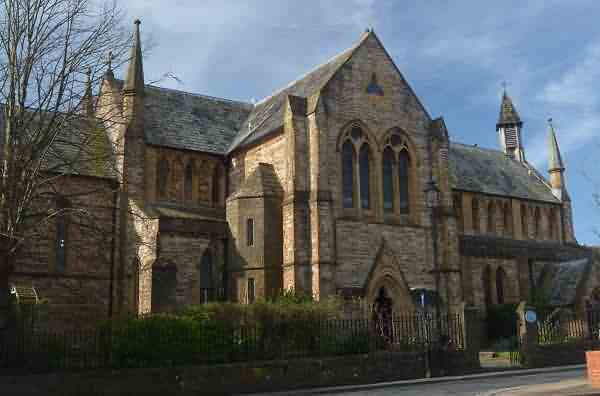 Holy Trinity church photographed from the Peter Street car park in 2017. 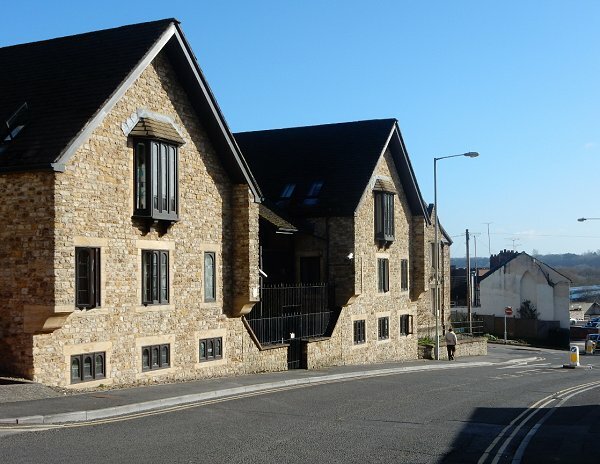 Yeovil Trinity Foyer, built onto the rear of redundant Holy Trinity church in 1996 to provide accommodation and training to young people aged between 16 and 24 years old. Seen from South Street and photographed in 2015. Just beyond, the chap is walking past Woborn Almshouse which, in turn, is next to the junction with Bond Street. 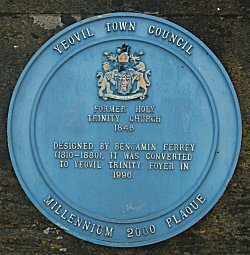 Yeovil Trinity Foyer - now closed. photographed in 2017.